Stunt scooters can definitely be expensive. ​This is because they have to be built with strong but lightweight materials in order that they can withstand the punishment kids put them under when doing tricks, stunts and jumps. However, it is often difficult to justify spending an awful lot of money on a stunt scooter when your child may decide doing tricks on a scooter isn't really for them a couple of months after spending pounds on an expensive scooter. Therefore in this article there a range of cheaper stunt scooters with an explanation of what you are getting for your money. ✔️ Advice - Wheel cores. The core of the wheel is very important as they need to be able to withstand the excessive force from landings. On pro level scooters you will always see metal (alloy) core wheels and these are the best. Entry level stunt scooters will often have nylon core wheels (a strong type of plastic). Nylon cores are strong but generally better for cruising, not as strong as metal cores. Metal core wheels are generally much better than nylon or plastic core wheels as they are more durable and stronger to withstand the abuse of tricks at the skate park. Nylon core wheels are cheaper and can be found on budget scooters. Alloy cores should definitely be sought out for teens and adults. Scooters for younger kids (age 6 or 7) often do have nylon cores and these are generally okay while kids are younger and lighter as there is not as much force on landings, although metal cores are still better. This scooter is an excellent budget stunt scooter for kids around 8 years plus and it has excellent reviews. It's a good one to try out first stunts and tricks. And if they decide stunts aren't for them, it can still be used from getting from a to b.
Metalised urethane wheels - the metalised cores are not as good as alloy cores but will withstand the extra impact needed from stunts. The urethane wheels offer a smooth ride. Fixed riser handlebars - always go for a fixed handlebar on a stunt scooter and not an adjustable one. An fixed handlebar will make sure that the scooter is strong enough to withstand the extra impact from tricks. Summary - This is a great option for younger kids to have a first go at the skate park. Lightweight but strong enough to withstand those first tricks. A good budget buy. Sometimes it's good to choose a well known high quality scooter brand to make sure the scooter is high quality and will last. Slamm scooters are reasonably priced but the UK company have been making freestyle scooters for years. The rider height is 76cm. The rider height is the height between the deck and the handlebars. Ideally you want the handlebar height to come between hip and waist height on a stunt scooter. The scooter can be customised and upgraded if required. The scooter has impact resistant bar ends giving style and added protection to the ride. If you can stretch your budget, this is an excellent beginner stunt scooter. ✔️ Threaded Forks vs Threadless Forks - most budget scooters will have a threaded fork whereas high end scooters will have a threadless fork. A threadless fork is stronger than a threaded fork so if you see it on a a cheaper scooter this can make it a better choice. This is the cheapest stunt scooter featured on this page. It has good reviews over on amazon. However it is unclear how many of those reviews are actually of kids doing stunts. If you have a teenager or a child serious about doing tricks I would go for something a bit better. 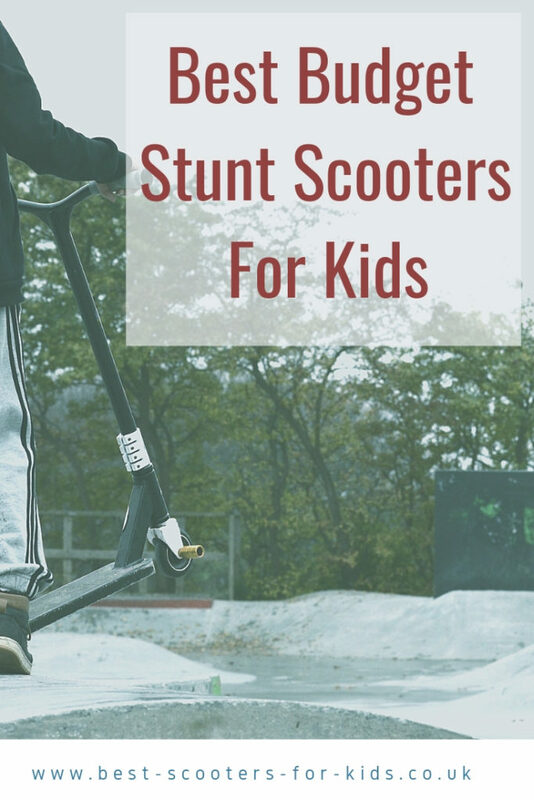 However if it's for a younger child who just wants to have a go at doing a few stunts and wants to use it as a stunt scooter as well it could be worth considering. Wheels - 100mm 88A PU super high rebound with plastic spoke cores. The wheels are perfect for street scooting. Ideally a stunt scooter should have metal cores as they are more durable. However if it's for a younger, lighter child who just wants to scoot around and do the odd trick or too at the skatepark, this scooter could be a good choice. Weight - the weight varies slightly depending on which model you get but it's around 3.5kg which is a good weight for a stunt scooter. Summary - if you're buying for a younger child who just wants to try the odd trick or too this could be a good choice. Otherwise a scooter with alloy core wheels might be a better. ✔️ Wheel size - most budget scooters will have a wheel size of 100mm. This size is fine for doing tricks and stunts for kids. On some more expensive scooters you will see a wheel size of 110mm and on pro scooters 125mm wheels. Bigger wheels do offer a bit more speed and more durability as they have more urethane but for a beginner scooter 100mm will be fine. Spend a little bit more money for the 3 Style stunt scooter and get some really excellent features for the price. Overall weight is 3.4kg which is quite lightweight for a stunt scooter. ✔️ Weight - Stunt scooters need to be strong but lightweight. The more lightweight the scooter the better it is to do tricks. You may see stunt scooters between 3kg and 4.5kg. The more expensive stunt scooters are deisgned to be as lightweight as possible but with strong materials hence the extra cost. Sometimes lighter, cheaper scooters may have features such as plastic wheels that don't weigh as much but obviously aren't as strong. Another option of a first budget stunt scooter for a kid starting to try out tricks is the Albott stunt scooter. Again, it's plastic core wheels mean it isn't the best choice for a kid who's going to be using at the skate park a lot. But for a younger child who just wants to have a go, it could be a good choice. Height 82cm - ideally with a stunt scooter you want the bars to come up to around hip to waist height. Another excellent entry level stunt scooter from Slamm which can be found at an amazing price point for the features. It's very similar to the Slamm classic above except the wheels are 110mm and features a dipped handlebar. Pro grips with impact resistant bar ends. Ride height (from deck to top of handlebar) is 76cm.